The official Party Spokesman, Comrade J. J. Carney, has stated that Comrade Party Chairman and President Barack Barackovich Obama will host a gathering of children from throughout the USSA who plan to ask him for help with matters ranging from State security to problems with their parents at a meeting to be held in the White Fortress on Wednesday. “They will be joined by children around the country expressing their concerns about gun violence and school safety, along with their parents,” Carney confirmed. Comrade President Barack Barackovich has already pledged to offer these children all the resources of the State to help them with their concerns over their parents, along with school safety and the Party’s struggle towards universal disarmament. B. B. Obama has already completed 19 Executive Orders aimed at the pacification of the Masses through weapons and ammunition control, and these children will be present to express their demands that more be done to control their parents. The Party is working diligently to form Young Socialists who will help guide their parents in the Progressive direction of the Party. Citizens should congratulate children who bring their concerns about their parents to the State, where these matters are best dealt with. After all, the State cares for children not only through the finest education system in the world, but also Universal Health Care Rights, Collectivization, mandatory Unionization, and generous Welfare Benefits. The Department of Social Justice will likely be instructed by the President to investigate the children’s parents to make certain they are not being abused by receiving non-Socialist upbringing. Parents from the Bourgeoisie and Kulaks will likely find themselves being invited to mandatory State-sponsored parenting courses for the sake of their children’s concerns. The mere thought of Our Dear Leader surrounding himself with children brings back so many pleasant memories of Saddam Hussein doing that very same thing as his regime faced a UN ultimatum of invasion before Desert Storm. Both Barack Hussein and Saddam Hussein are splended examples of selfless leaders, having displayed their personal courage and moral integrity to the world..... all the while serving as protectors of our children's futures. As always, you nail the hit on the head-- i.e., you recognize something important before my hand has had a chance to strike my forehead accompanied by the exclamation, "Why didn't I think of that?" The answer is quite simple-- I don't have any children left around to guide me. They've become grownups and are still desperately seeking to produce their own children for their own guidance. They've become quite frustrated at their loss of wisdom since attaining adulthood. Soon, Obama will isslue Wise Phones (better than Smart Phones) so they can used them to dial-in to the White House's 9-11 service for children abused by parents rejecting their wisdom. You don't understand - Dear Leader is only taking a page from the Religion of Peace by using children as human shields. This is all the rave in the Middle East! Thank you, comrade Obama, for saving the children from the menace of guns, family, liberty, work, and other outdated values! A Father to the Fatherless of the Father who are made Fatherless by the Father of the Fatherland. So Carney barked about a “concrete package,” eh? Is that like the Chitcago style cement overshoes option if there is a failure to comply? It's time for a fundamental transformation of our government that will match Dear Leader Obama's fundamental transformation of America, the meanest, stingiest, most racist and hateful country on Earth. Dispose of the expensive, corrupt, and gridlocked Executive, Legislative, and Judicial branches of government and replace them with a Juvenocracy, government by the Children™ . How will this work? Simple, almost like a lottery. All the elementary schools in the nation will be put in a database. Every week a single school will be selected. Once the school is selected, a grade K thru 6 and a classroom will be chosen. Then, in a one day session, Obama will present the students of this class with the issues that must be decided by them and, at the end of the day, a vote will be taken to decide these issues. The outcome will immediately become the law of the land. Both the school selection and the votes will be weighted by the social justice needs of the school and the selected students. What could be more fair? Juvenocracy... I like it! Very revolutionary! The new motto, "Don't trust anyone over 17!" A very good thing Dear Leader is addressing these issues. I am reminded, as a socialist worker, of the many abused and neglected children I have seen in my practice: kids who did not get puppies for Christmas. Kids who have to do their homework before watching TV, or experience barbaric "time-outs". Kids not allowed to bash their sisters' head in if she uses their Nintendo...it's heartbreaking, really. 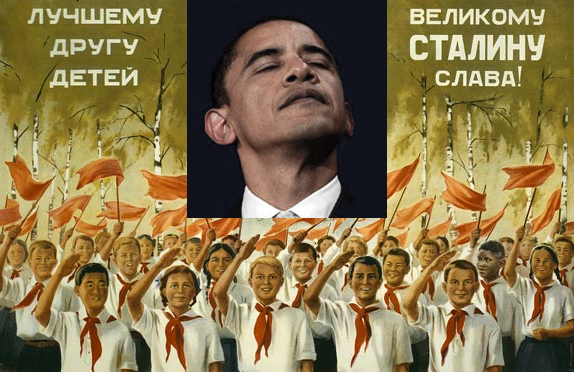 Thank you, comrade Obama, for liberating us from the horrors of American values! That is so sweet, those eight year olds that just spontaneously rose up all on their own and wrote letters to Obama. I feel scared and all alone in the world and feel like capitalists are just about to kill us all with guns. Please sign into law magic red balloons that will fix everything. And please instruct that darned congress to make lots more legislative magical pretty red balloons that'll make me feel warm and safe. I, Barack Obama, your Fearless Leader, commend you, Comrade Nomenclature Climber, for so clearly perceiving the progressive wisdom of my action is taking counsel from wise children. Those who question such course of action must be suffering from ideological amnesia-- After all, wasn't it the wise advice to Jimmy Carter from his then-minor daughter, Amy, on how to end the nuclear arms race with Russia that enabled Carter to have such unparalleled success in that area during his all-too-short administration? You ought to depict a little bit bigger ears here, Comrade Red Square. I agree that this kind of caricatures are more powerful when depicted to proportion, but I adore Barry's ears. Звідки ж набрався він сил? Mi - thanks for reminding me my favorite Lenin poem by Maksim Rylsky. Such poetic verbiage caused me to fail Ukrainian literature time and again, since my brain refused to memorize these lines for mandatory recital in class. I just wasn't good enough for this sort of material. That is, indeed, the poet, but it is not the poem, comrade... Maybe, English -- the tongue of Imperialism -- really is not a good language for this sort of sentiment, and needs to be augmented first. Something, some comrades have already started (denouncing the "hate on Obama" for example). ...kids who did not get puppies for Christmas. Kids who have to do their homework before watching TV..."Placing The Children™ in this double-bind situation is barbaric! How is a little one to use the traditional "dog ate my homework" excuse if the child has no dog?! This is child abuse! Shocking! Now wait just a minute - who let the dog out? - who? who? who? - and was it near the White House when last seen? Is this a roughly korrect translation? He grew rusty over the world. Yes, he is titanium, for "titans"
Ice frozen in their laws. Whence he had the power? Gesture made ​​by fire right. That sounds like something a modern San Francisco free-verse poet would write under the influence of some medicinal grass. Very intriguing, and if you don't understand it, that's because you haven't expanded your mind wide enough to grasp its elusive meaning. But if you have, it all makes perfect sense and you can actually see the music hidden in these lines. What I don't know is how Rylsky and my Ukrainian Literature teacher would have responded to all this - my post, your translation, and the People's Cube in general. With an amused chuckle, no doubt. The poets I have encountered over my life indulge in many emotions (exclusively their own) but almost never humor. I am still waiting to meet a poet with a sense of humor. Yes, I am getting back to work, Comrade Assistant Supervisor! There was and still is a lot of excellent witty and humorous poetry in Russia, but it's all exclusively on the anti-establishment side. Not all of it is political, but rather a mix of everything. It's sort of a form of folk art. All of the poets I know of are from the American context. I think different cultures have different approaches to poetry. I remember years back a chairman of a Middle Eastern business told a group of us how, during the corporation's annual meeting, he read a poet to the board and stockholders. The Americans in our group chuckled and ignored everything else he had to say, whereas the Easterners understood that he was trying to tell his audience about his commitment to the company's success and saluted their participation. Americans tend not to take language all that seriously, which is partly why we are in the situation we are in.